On my way to the DakhaBrakha show, as the cold and lonely after-rush-hour Chicago swam by, the band’s solemn “Nad Dunaem” (“Over Danube”) came on in my headphones. Between the pauses of the melodic vocals and the distant hums of the harmonic, I zoned out, only to come back to the far less pacific cannons of the Red line. And such was their concert – an alchemy of familiar tones spiced with crafted peaks of DakhaBrakha’s brilliant voices. By the time Marko Halanevych thanked the generous audience for the first time (after the opener), the room was theirs. Then came “Oi za lisochkom” (“Far by the creek”), a fine crescendo of vocals and tender bass, a composition in the realm of its own. Iryna Kovalenko poured her sharp Old Ukrainian dialect into Nina Garenetska’s somber cello, then Marko’s resonant vocals stole our ears, all to Olena Tsibulska’s colorful drum tone. Then there was a jazzy twist, a rhythmic tune about how to plant Ukrainian beans, but what DakhaBrakha sang mattered far less than how they did it, how they organically merged their poised voices and skillful multi-instrumentalism with the unknown to most of us ethnos, a mystical land that has seen much agony and far less joy, peoples firm in their melodies and witty in their tongue. Spontaneously all this cliffs back to Marko’s echo, back to a bizarre bag pipe-sounding flute, to the vivid atmosphere of the show. 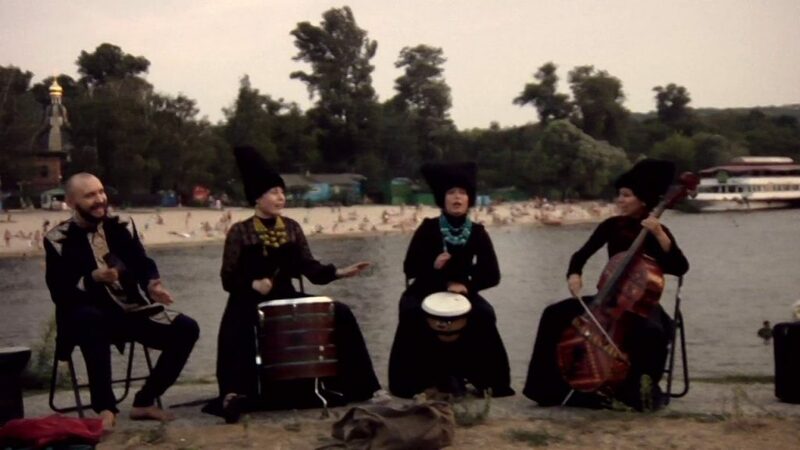 Like true Ukrainians still hibernating after their late Eastern Orthodox Christmas, DakhaBrakha produces a schedrivka, a traditional well-wishing and celebratory tune, one I’ve never heard before. Again, splendid. Even my Peruvian neighbors agree. In my conversation with Marko after the show (I admit, I pretended to have recorded it – “Can we do an interview for our listeners?” sounds substantially less preying than “I just want to talk about this music of yours”), a colleague interviewer asked about the environments in which the group prefers to play. The truth is that this journalist-y query fades behind DakhaBrakha’s virtuous performance, regardless of the venue or the quantity of hands clapping. With this band comes some strange ambiance, one that no mic can amplify and no record can reproduce. To an unfamiliar ear it’s all a beautiful sound contraption – mysterious, profound, virgin. To this humble servant, it’s a summer’s trip into the dense Ukrainian woods my six-year-old self used to make; it’s my grandmother’s painful but sweet lullaby, one I will never fathom hearing but will always shiver when I do.